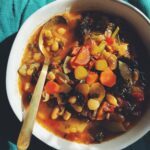 Packed with kale, beans, zucchini and more - This detox soup is perfect for fighting a bloated belly! 1 tsp red pepper flakes or less if you don't like it spicy! Add olive oil, onion, celery, carrots, garlic, salt and red pepper flakes to a heavy bottomed pot over medium-high heat and begin to brown. Once they begin to caramelize, add zucchini, turmeric and a little bit more salt. Cook down for 3 minutes before adding the can of roasted tomatoes, chicken or bone stock and vinegar. Simmer for 30 minutes. Add white beans and kale and cook for another 15 minutes. Finish with the juice from 1 lemon and if you'd like - add about 1/4 tsp more of cayenne pepper to make it even spicier! !